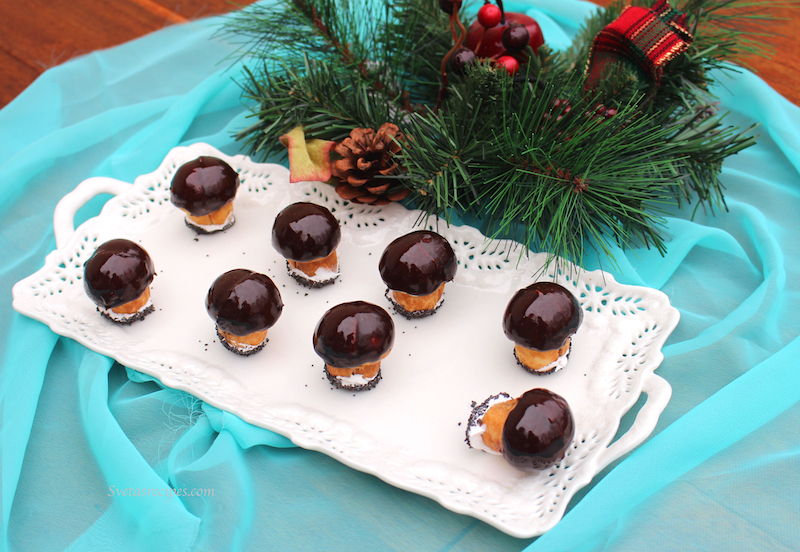 These mushrooms filled with Dulce-De-Leche are a must at any Slavic wedding or special occasion. They are beyond delicious and are very well liked by many. Yes, it defiantly takes some time to make them but i would say that it is well worth the work. 1) Mix butter with flour very well. 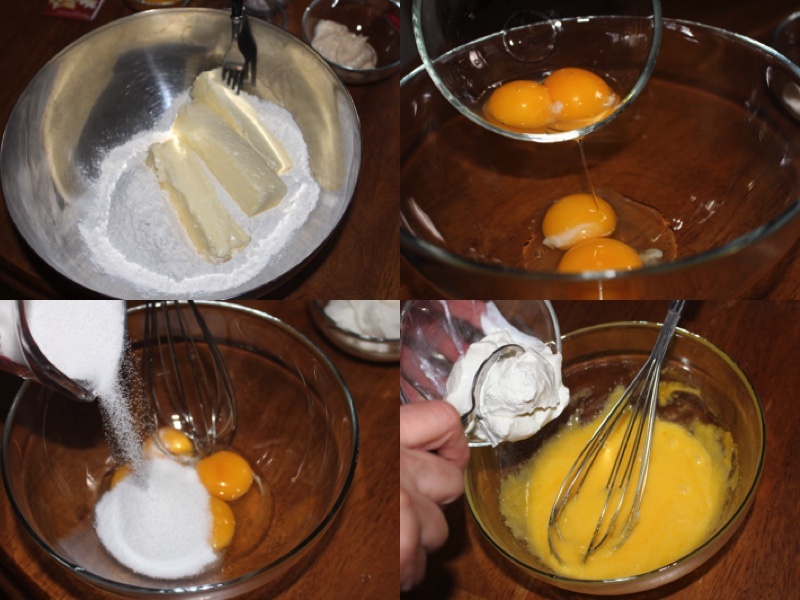 2) In a separate bowl mix egg yolks and sugar until the sugar will completely dissolve. 3) Add sour cream into the egg yolk mixture. 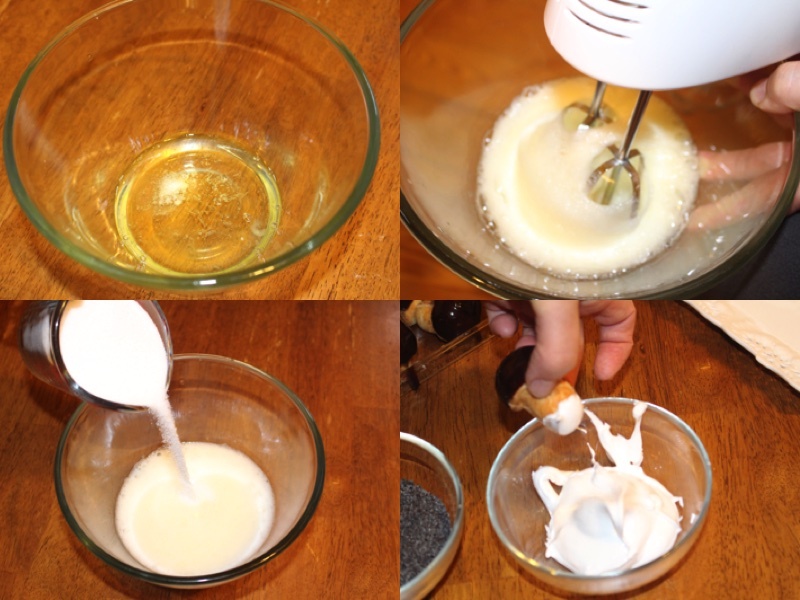 4) Add Mayonnaise, vanilla sugar, and baking powder and mix it good. 5) Combine egg mixture with the flour mixture and mix with your hand very well until all of the dough holds together very well . 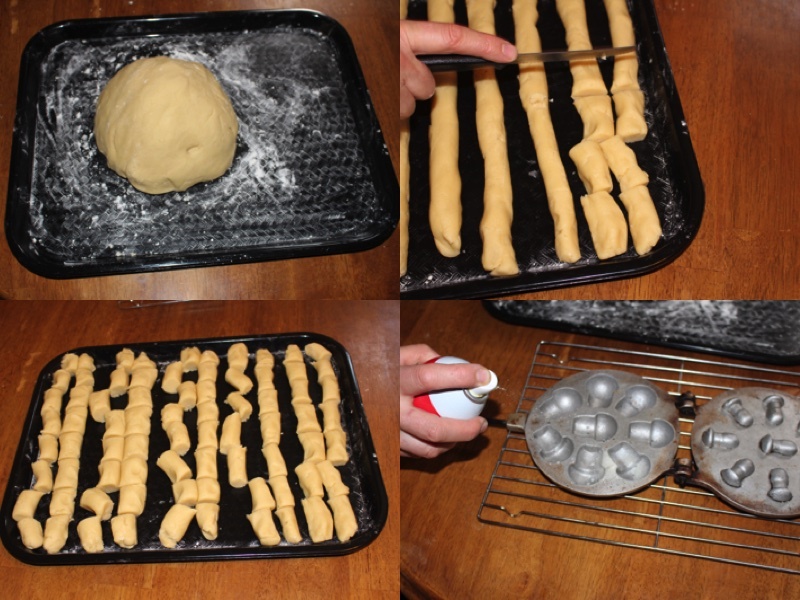 6) Divide the dough into ten equal long strips of dough and line them up parallel to each other on a tray. 7) Cut each of those strips of dough into 11 equal pieces. 8) Spray the mushroom pan with stick resistant spray only the first time your making a load of mushrooms. You won’t have to do that after this time because there is butter in the dough which will prevent it from sticking. 10) Bake on a stove on medium heat each side for 12 minutes until the mushrooms look light golden. 11) When they are done open the mushroom pan carefully and the mushrooms should fall out easily by them selfs onto a tray. 12) For the fillings of the mushrooms you will need two cans of condensed milk cooked for 3 hours in a pot half way full of water. 13) After you have made your Dulce-de-leche cream let it cool down first. 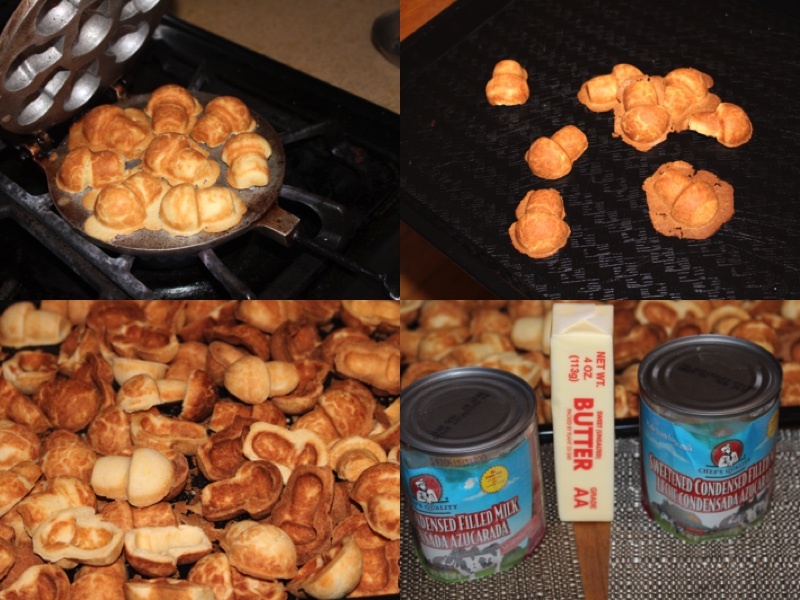 Then put it into a bowl and mix with one stick of butter very well. 14) With a spoon fill in both sides of the mushroom and stick together. 15) In a big pot combine sugar/hershey’s cocoa/ butter/ milk. 16) Mix all of the ingredients in the pot very well. On medium heat bring it to a boiling point and then turn it off. While it is cooking though don’t forget to keep mixing it so it doesn’t stick to the bottom of the pot. When you have it done make sure to decorate all of the mushrooms while the chalet mixture is still warm. 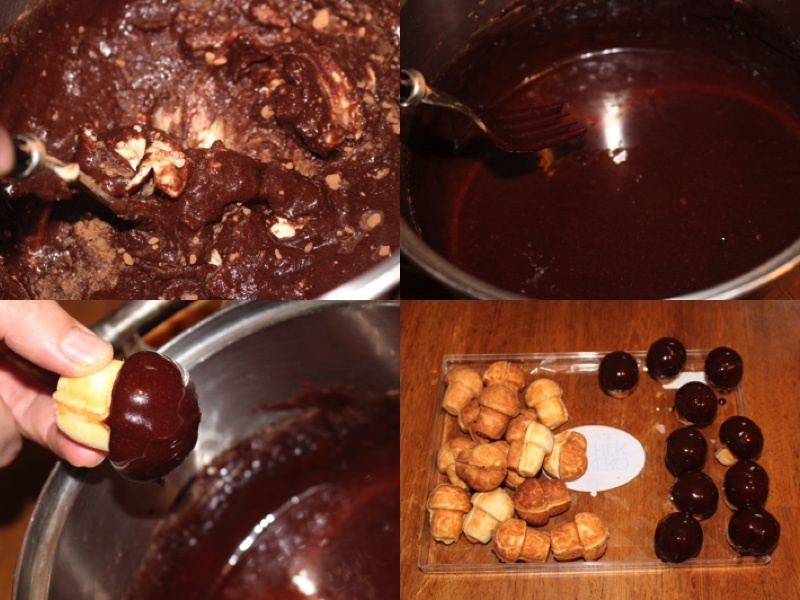 17) Hold each mushroom in your hand and dip the head portion into the chocolate mixture. Place them all next to each other in a tray standing up so they don’t fall over. 18) Place egg whites into a bowl and add a little bit of salt. Beat it with a mixer until it becomes fluffy. 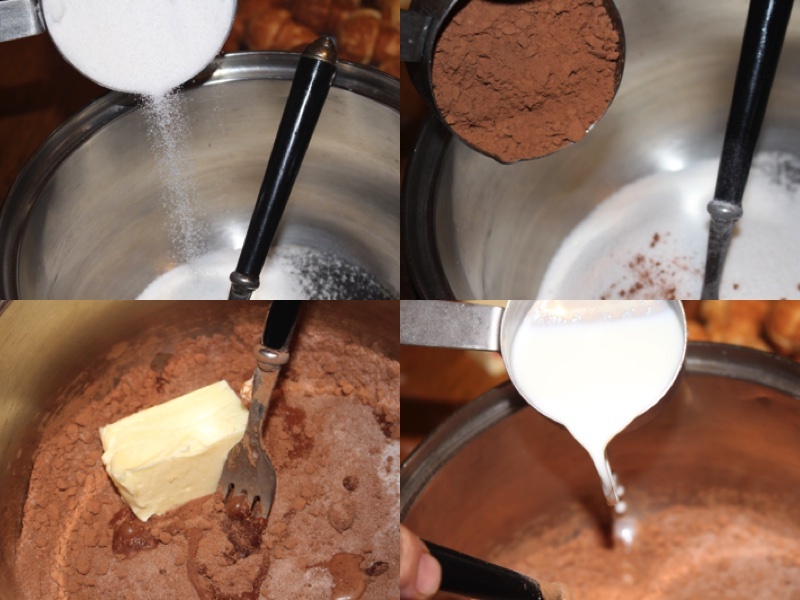 19) add sugar and beat with a mixer again until the sugar is completely dissolved. 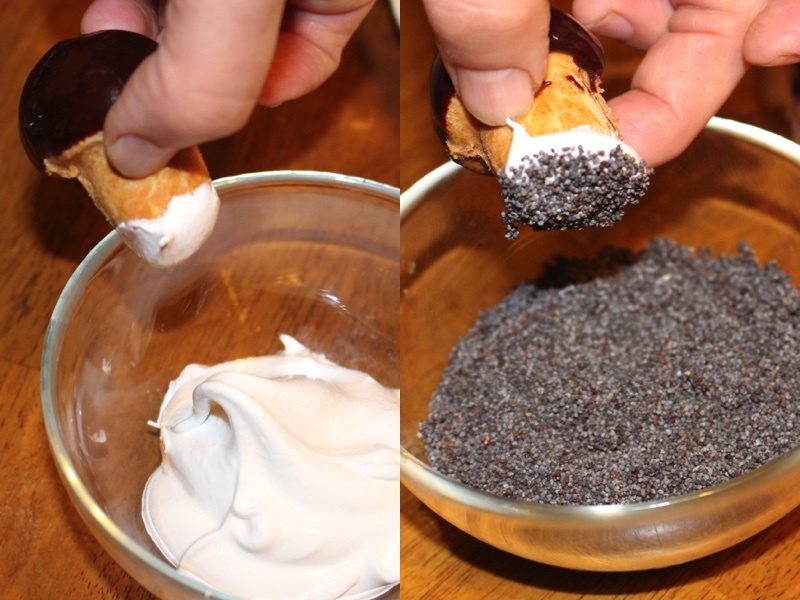 20) Dip the bottom of the mushrooms into it gently and then dip it into the poppy seeds. 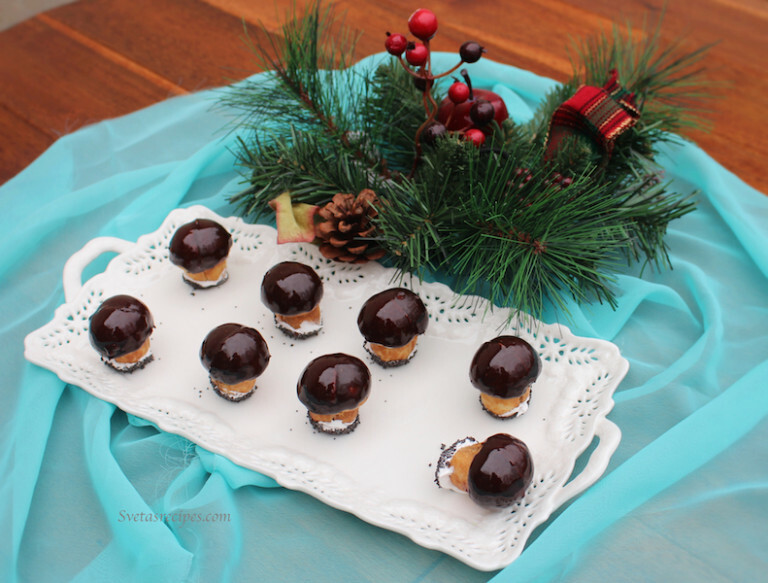 These mushrooms filled with Dulce-De-Leche are a must at any Slavic wedding or special occasion. They are beyond delicious and are very well liked by many. Yes, it definatly takes some time to make them but i would say that it is well worth the work. In a separate bowl mix egg yolks and sugar until the sugar will completely dissolve. Add sour cream into the egg yolk mixture. 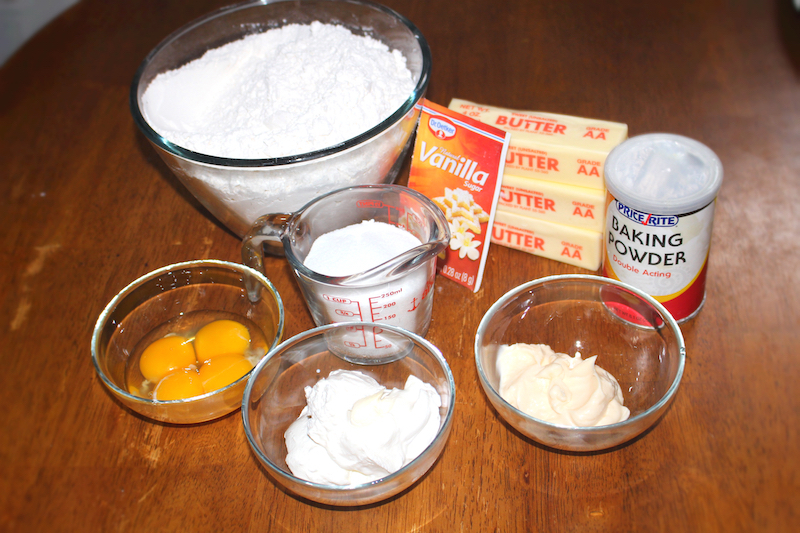 Add Mayonnaise, vanilla sugar, and baking powder and mix it good. 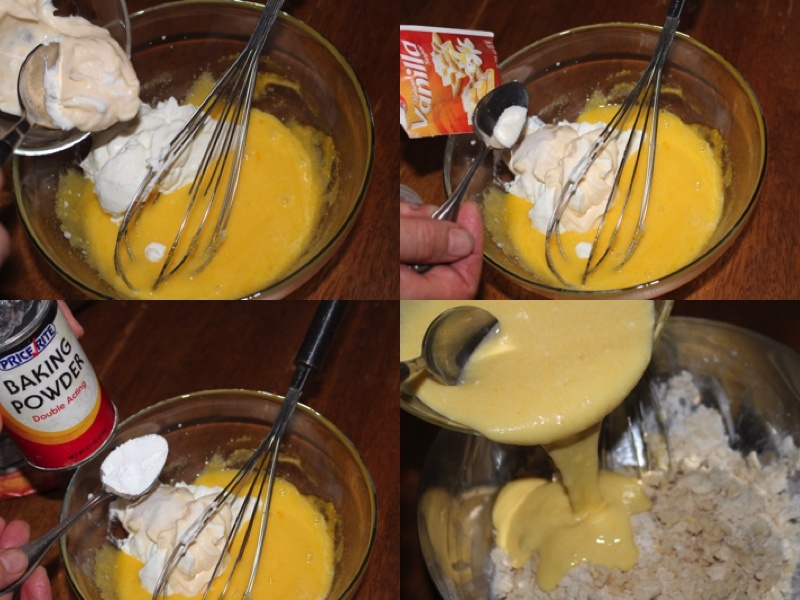 Combine egg mixture with the flour mixture and mix with your hand very well until all of the dough holds together very well . Divide the dough into ten equal long strips of dough and line them up parallel to each other on a tray. 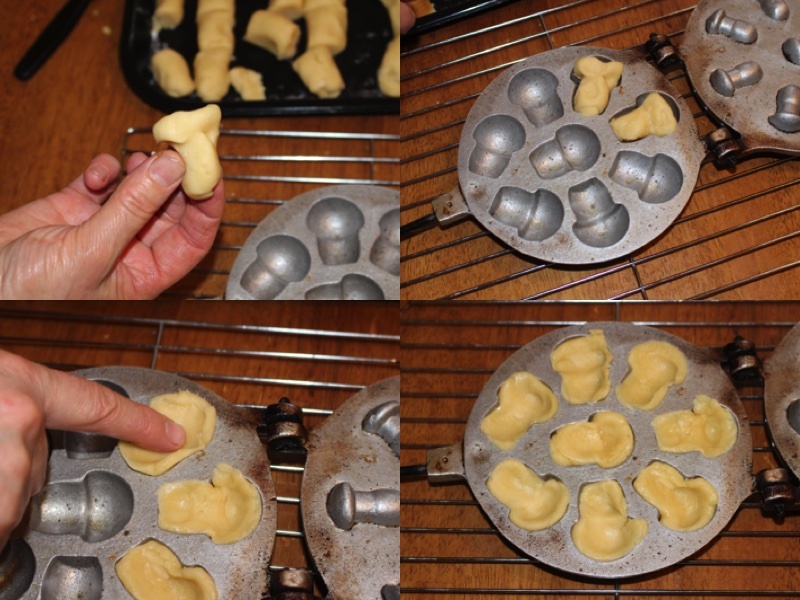 Cut each of those strips of dough into 11 equal pieces. Spray the mushroom pan with stick resistant spray only the first time your making a load of mushrooms. You won't have to do that after this time because there is butter in the dough which will prevent it from sticking. Bake on a stove on medium heat each side for 12 minutes until the mushrooms look light golden. When they are done open the mushroom pan carefully and the mushrooms should fall out easily by them selfs onto a tray. For the fillings of the mushrooms you will need two cans of condensed milk cooked for 3 hours in a pot half way full of water. 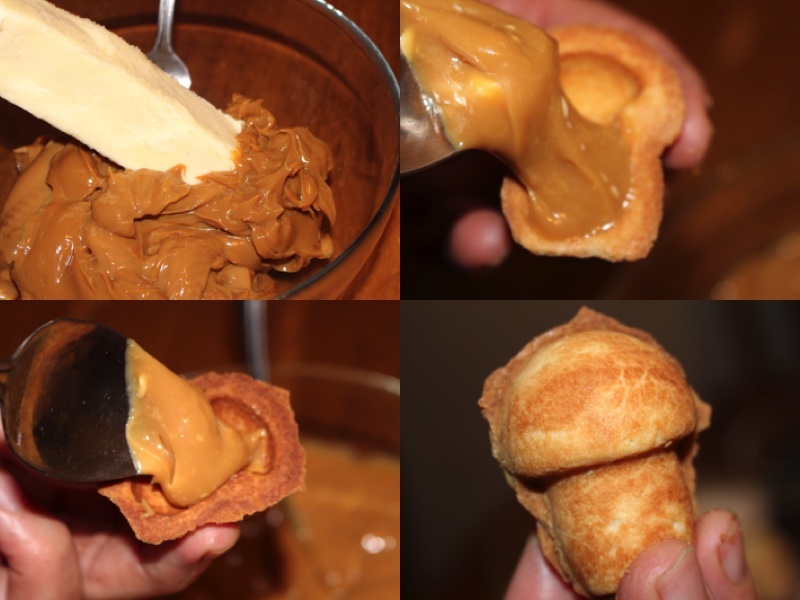 After you have made your Dulce-de-leche cream let it cool down first. Then put it into a bowl and mix with one stick of butter very well. With a spoon fill in both sides of the mushroom and stick together. In a big pot combine sugar/hershey's cocoa/ butter/ milk. Mix all of the ingredients in the pot very well. On medium heat bring it to a boiling point and then turn it off. While it is cooking though don't forget to keep mixing it so it doesn't stick to the bottom of the pot. When you have it done make sure to decorate all of the mushrooms while the chalet mixture is still warm. Hold each mushroom in your hand and dip the head portion into the chocolate mixture. Place them all next to each other in a tray standing up so they don't fall over. Add sugar and beat with a mixer again until the sugar is completely dissolved. Dip the bottom of the mushrooms into it gently and then dip it into the poppy seeds.